All TYR Durafast Elite products have an antimicrobial lining for odor protection and long lasting freshness. Due to their chlorine proof and colorfast nature, Durafast Eliteswimsuits are able to sustain 300+ hours of use, while maintaining a comfortable hold on your body. So no matter which of the solid colors you choose, you can be sure these performance swimsuits will shine as bright as you do in the water. Very happy with the accuracy on size. Well made product. The elite jammer swimsuit fits well, it is durable and most of all it swims well! Q: Would these be OK for the run in a triathlon? A: Thank you for your inquiry. 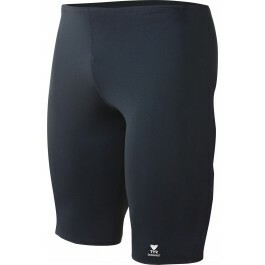 The Men's Durafast Elite Solid Jammer Swimsuit is designed for training. These will work well for the run. The jammer does not include an amp pad. A: Thank you for your inquiry. Without having your Waist and Hips measurements, it's difficult to properly assess size. If you review the "Size Chart" tab beneath the product image, you will find corresponding sizes and dimensions. Q: What is the inseam on this? A: The Durafast Elite Solid Jammer has an inseam that is roughly 10.5 Inches in length. Q: If I am between sizes, should I go smaller or larger? A: If in between sizes, we would recommend sizing up. Q: I have a 32 inch waist but the clothes I wear (jeans, etc.) are usually 28 to 30. Is your 32 inch waist true to size or does it fit like other clothes on the market? A: Thank you for your inquiry. A Size 32 Jammer will accommodate a 32-33 Inch Waist and 38-39 Inch Hips. Measurements are true and designed for a performance fit. A complete size chart appears in the fourth product tab marked "Size Chart," beneath the product image. 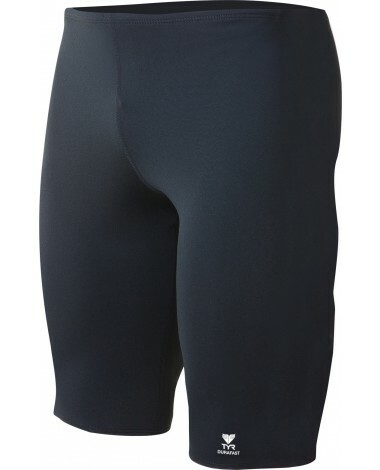 Constructed with TYR's most durable textile - Durafast Elite - the Men's Durafast Elite Jammer Swimsuit utilizes high denier poly fiber and innovative circular knit construction.